Could this be a Dy-Dee doll? This is a photo of my mother on Christmas morning, 1958. 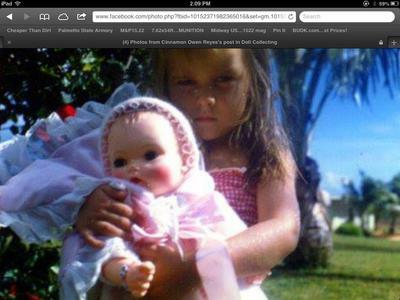 The doll in the photo has all the original clothing and accessories. The doll has molded hair, curved hands, a short ruffled bonnet, a wide satin ribbon on her dress, a pink ruffled pillow, and an ID bracelet. I do not own this doll, but I'm looking for one with all the original accessories. I'm not sure of the make of this doll. But I think she is an Effanbee doll, and maybe a Dy-Dee baby. Comments for Could this be a Dy-Dee doll? She is Effanbee's My Fair Baby.